Why Is Toenail Fungus Such a Menace? A fungal infection is the gift you never wanted, but it just keeps on coming every year. It’s the stale fruitcake… the pink fluffy footed pajama suit from grandma… yet another corny coffee mug to come toppling out of your cupboard. No one wants foot fungus, but it can be extremely easy to pick up — especially if you have a genetic proclivity toward succumbing to fungal infections. – It reproduces by teeny tiny spores you can’t even see – and, yes, they get absolutely everywhere! So the portent for reinfection seems imminent. Effective treatment requires people to disinfects socks and bed sheets, use a SteriShoe UV shoe sanitizer on old footwear, and treat the feet with antifungal spray. 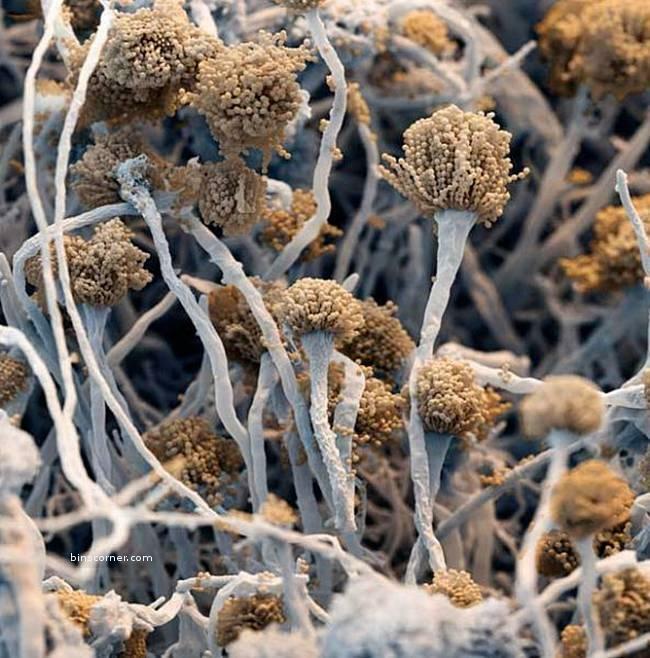 This amazing photo by Brandon Brills is actually the aspergillus fumigatus fungus that causes sickness in immunodeficient patients. However, it gives you a good idea of just how tiny the reproductive spores of a fungus can be! Why Do Most Toenail Fungus Treatments Fail? Treatment can take up to a year, as you wait for your fungal nail to grow out and a new, healthy nail to grow in. However, that’s only if you’re lucky enough to A) Find a treatment that works for you, and B) Avoid reinfection during your course of treatment. According to UK podiatrist Junaid Ahmed of London’s Feet For Life center, 40% of patients have never found a toenail fungus treatment that works on them. He explains that lacquers and lotions do not penetrate the nail bed — and, therefore, do not work. Oral antifungal drugs have to be taken daily for long periods of time to be effective and can have serious side effects ranging from stomach pains and nausea to taste loss and liver failure. Many runners suffer toenail trauma from placing so much wear-and-tear on their feet. Laser treatment offers way they can turn back the clock on fungal nails. Toenail fungus lasers are at least safe and easy. They apply intense heat down to the nail bed, which destroys the heart and soul of the fungus, while leaving surrounding tissues alone. All this happens in less than 30 minutes, with most treatments taking just one treatment. Of course, there are a few downsides. For one, it can be expensive — around $1,000, unless you can find a deal. Also, laser system manufacturers are careful not to promise a complete cure rate. Cutera’s Laser GenesisPlus system, for instance, says that only 68% of the infected toenails show significant improvement after three months. For now, it’s the best science has to offer. What Does Laser Toenail Fungus Treatment Feel Like? According to Leah Hardy, the treatment doesn’t feel like anything at first, but as time goes on, she says she feels “a sensation of warmth.” She adds, “At times, I see the tiniest wisp of smoke — apparently the spores being vaporized — and feel a sharp burning pain.” After the treatment, her nails look the same, but the yellow patches grow out with the nail. The doctor tells her she may “never get [her] youthful, perfect toenails back,” but she can, at the very least, look 10 years younger in 12 weeks.